Last October, Science published the paper “Estimating the Reproducibility of Psychological Science” (.pdf), which reported the results of 100 replication attempts. Today it published a commentary by Gilbert et al. (.pdf) as well as a response by the replicators (.pdf). The commentary makes two main points. First, because of sampling error, we should not expect all of the effects to replicate even if all of them were true. Second, differences in design between original studies and replication attempts may explain differences in results. Let’s start with the latter. The commentators provide some striking examples of design differences. For example, they write, “An original study that asked Israelis to imagine the consequences of military service was replicated by asking Americans to imagine the consequences of a honeymoon” (p. 1037). This is not about pointing fingers, as I have also made this mistake: I did not sufficiently describe differences between original and replication studies in my Small Telescopes paper (see Colada ). This is also not about taking a position on whether any particular difference is responsible for any particular discrepancy in results. I have no idea. Nor am I arguing design differences are a problem per-se, in most cases they were even approved by the original authors. I am also sympathetic to the commentators’ other concern, which is that sampling error may explain the low reproducibility rate. 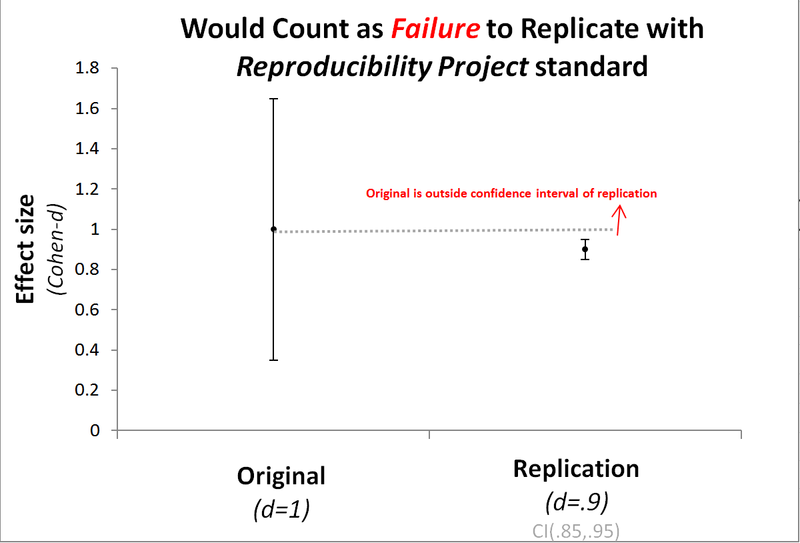 Their statistical analyses are not quite right, but neither are those by the replicators in the reproducibility project. A study result can be imprecise enough to be consistent both with an effect existing and with it not existing. (See Colada for a remarkable example from Economics). Clouds are consistent with rain, but also consistent with no rain. Clouds, like noisy results, are inconclusive. Both sets of authors examined whether the results from one study were within the confidence interval of the other, selectively ignoring sampling error of one or the other study. In particular, the replicators deemed a replication successful if the original finding was within the confidence interval of the replication. Among other problems this approach leads most true effects to fail to replicate with sufficiently big replication samples. 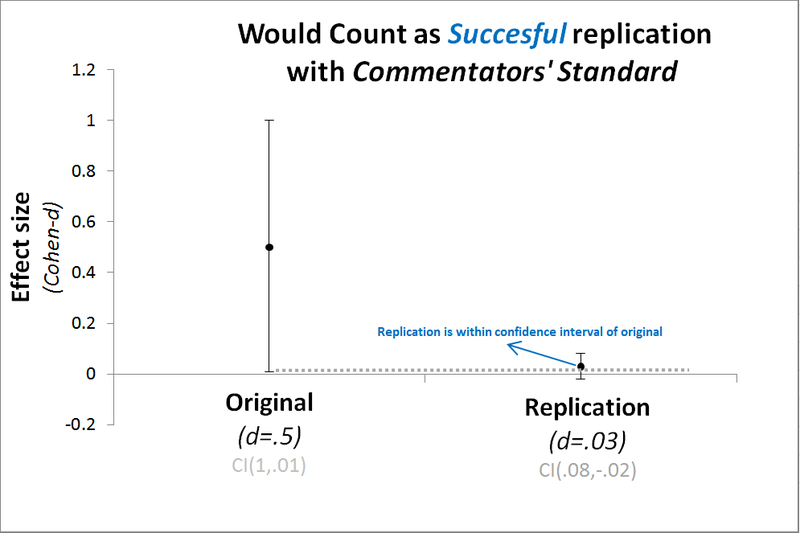 The commentators, in contrast, deemed replications successful if their estimate was within the confidence interval of the original. Among other problems, this approach leads too many false-positive findings to survive most replication efforts. For more on these problems with effect size comparisons, see p. 561 in “Small Telescopes” (.pdf). Inconclusive replications are not failed replications. (i) Small Telescopes (.pdf): Test whether the replication rejects effects big enough to be detectable by the original study, and (ii) Bayesian evaluation of replications (.pdf). 2. Design differences between original and replication should be prominently disclosed. I shared a draft of this post with Brian Nosek, Dan Gilbert and Tim Wilson, and invited them and their co-authors to provide feedback. I exchanged over 20 emails total with 7 of them. Their feedback greatly improved, and considerably lengthened, this post. Colada Co-host Joe Simmons provided lots of feedback as well. I kept editing after getting feedback from all of them, so the version you just read is probably worse and surely different from the versions any of them commented on. My views on the state of social science and what to do about it are almost surely much closer to those of the reproducibility team than to those of the authors of the commentary. But. A few months ago I came across a “Rationally Speaking” podcast (.htm) by Julia Galef (relevant part of transcript starts on page 7, .pdf) where she talks about debating with a “steel-man” version, as opposed to straw-man, of an argument. It changed how I approach disagreements. For example, the Gilbert et al commentary opens with what appears to be an incorrectly calculated probability. One could straw-man argue against the commentary by focusing on that calculation. But the argument such probability is meant to support does not hinge on precisely estimating it. 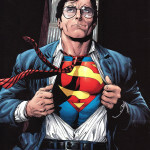 There are other weak-links in the commentary, but its steel-man version, the one focusing on its strengths rather than weaknesses, did make me think better about the issues at hand and ended up with what I think is an improved perspective on replications. We are greatly indebted to the collaborative work of 100s of colleagues behind the reproducibility project, and to Brian Nosek for leading that gargantuan effort (as well as many other important efforts to improve the transparency and replicability of social science). This does not mean we should not try to improve on it or to learn from its shortcomings.